No one is proposing to ship oil, Dan. 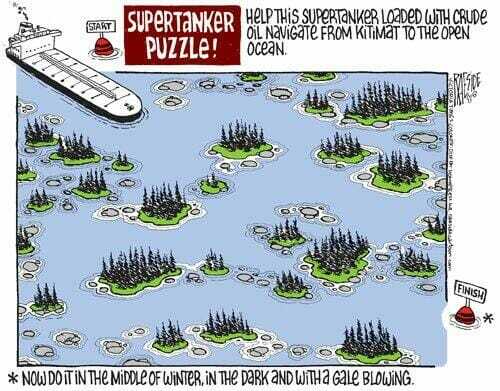 This is about transporting dilbit, not oil. The Alberta government could see to it that the energy producers refined the stuff into synthetic crude oil on site but this is a high-cost, high-carbon asset already at some risk of becoming ‘stranded.’ And with Athabasca’s already massive carbon footprint the last thing they want is even more troublesome greenhouse gas emissions from refining the crud in Alberta. Yes it will be First Nations leading the opposition but they won’t be alone. Far from it. Coastal British Columbians won’t stand for the Northern Gateway. As for Kinder Morgan, they’ll face powerful opposition from the municipalities of the Lower Mainland before they’re allowed to transform Port Moody into Port McMurray. But clearly you are correct to point out that bitumen (and the diluted bitumen flowing through these proposed pipelines) is significantly different to what most people think of as ‘oil’.